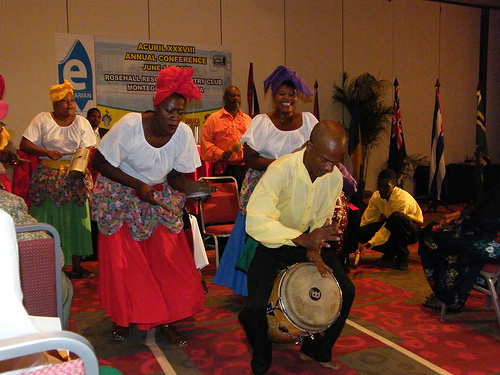 Kumina or Cumina is a cultural form indigenous to Jamaica . It is a religion, music and dance practiced by in large part Jamaicans who reside in the eastern parish on St. Thomas on the island. These people have retained the drumming and dancing of the Akan people. Like the Kongo practitioners from Cuba, who have kept a large amount of the Kongo language alive. Bantu-speaking peoples of the Congo. In the Americas there are many Kongo-derived religions still being practiced today. There are two main aspects of Kongo religion that are quite distinctive. One is the practice of bringing down spirits of the dead to briefly inhabit the bodies of the faithful. The purpose of this is so that the ancestors may share their wisdom, providing spiritual assistance and advice to those here on Earth. Without exception, all such faiths in the Americas retain this central feature of Kongo faith. The other feature is the extensive work with Inquices (Enkises, Nkisi). The Inquices are very like the Orishas of Yoruba tradition, but also different. In Cuba and Brazil, where Yoruba influence was strongest in the Americas, they are often syncretized with the Orishas. They may best be described as being both the most ancient of ancestors as well as being associated with specific powers in nature. The Inquices do not tend to possess as detailed a mythology as the Yoruba gods. 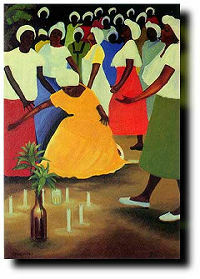 Kumina is a Afro-Jamaican religion influenced mainly by the Bantu peoples from the Congo-Angola area. Kumina refers to both a religion and dance. Dances include the Bailo, mainly used for entertainment purposes and the Country, used during the private religious ceremonies. Kumina provides a perfect example of what intra African syncretism. The Akan derived traditions of Myal and Obeah remain opposing entities within the Kumina religion. The Obeah man remains a master of science and the spirits while Myal is use to refer to refer to the possession of a Kumina dancers at religious ceremonies. According Joseph Murray, "The extraordinary insight of the scientist Myal brings revelation of the invisible world. 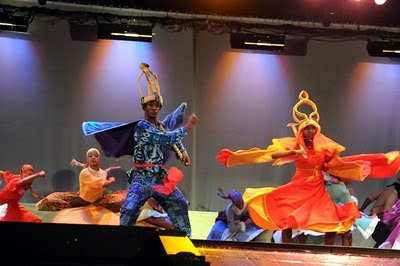 This state of mind allows the dancers to see the invisible workings of obeah as well as to transmit messages from the other world…" This borrowing of different African aspects and deities between enslaved Africans in Jamaica is also characteristic of African Tradition Religions, where a Yoruba deity might be accepted as a deity by the Evhe/Fon. One clear example in Jamaica is the Kumina deity Shango, which is a Yoruba deity who in Jamaica became a deity accepted by different African ethnic groups. Kumina deities are separated into sky bound and earth bound deities. Oto King Zombi, a sky bound deity is the Supreme Being. Other sky bound deities of Kumina are Obei and Shango. Earth bound deities in Kumina are found in the old testament David, Ezekiel, Moses, Cain and Shadrak and are examples of syncretism with Christianity. This hiding or masking Africa religious practices and deities within Christianity are another clear difference between African religion in Jamaica vs African Religion in Africa, where little or no political persecution forced involuntary adaptation of foreign religions within traditional African society. In Jamaica African practices were against the law during slavery, thus masking deities and other religious practices in the Christian religions was natural for survival. Ancestral spirits are also important in Kumina. The term used to refer to these ancestral spirits is Zombi, the term originates from the Kikongo word "dzambi" which means god. Allayes describes Zombies as "spirits of men and women who, in there lifetimes, were dancing Zombies, drummers, and obeah men." Only a person who has been possessed by a Zombi can become a Zombi after death. A Zombi had the privilege of returning to earth to preside over ceremonies and possess dancers and performing other duties. Unlike people who had been possessed by Zombies, those who had not been possessed would simply die and ascend to Oto King Zombi without chance of returning to earth. 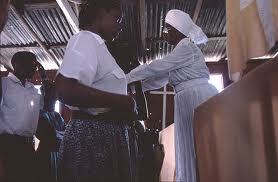 Organization of Kumina communities follows the general local character of African religions in Jamaica. Kumina communities are small family based communities or nations. Some nations include Mondongo, Moyenge, Machunde, Kongo, Igbo and Yoruba. People from Kumina families are given the title Bongo. Marrying into a Bongo family is one avenue to become apart of a Kumina nation; special initiation is the other avenue. Kumina nations are led by a King and Queen. "Elizabeth Spence a contemporary Kumina Queen, reported that her spiritual calling was also effected during a period of isolation. She slipped away from home one night to attend a Kumina event near Morant Bay. The drums impelled her to dance, soon after which she was knocked violently tot the ground by a possessing spirit. This was her first experience of Myal. She remained in this state for four days and four nights, neither eating, drinking nor able to get up. When she came ‘back to herself’, she saw ‘many different things’…the ‘ole arrivants’ taught her the African language and a lot of spiritual wisdom." From readings two women became a Queens after a receiving similar calling that that was in the form of spiritual revelations, possession, isolations, and what seems to be death and rebirth. Their abilities and status never seem to be challenged by the challenged by their nation. A master drummer was another important part of Kumina, since the presided over ceremonies. In her book Rock it Come over Olive Lewin describes the critical role of the drummer, "the cyas drummer is crucial to the success of a bands. He must not only be conversant with information about spirit activity and rhythm requirements but he must also learn the African language and interpret immediately. There are no short cuts to gaining this body of knowledge. Mistakes at this level will confuse singers, dancers and other knowledgeable participants, and threaten the success of any ritual or ceremony ‘if you don’t play the drum good, an know what you doing, not a thing happen: not a spirit come, whole night…"
Here we see drumming is not simply a musical skill for Africans in Jamaica, but understanding of the spirits and of African language is necessary to access the spiritual world. Bibliography Stewart, M. Dianne. Three Eyes for the Journey: African Dimensions in the Jamaican Religious experience. Oxford University press US, 2005. This book looks a the African-Derived and African-centered religious traditions that are found in Jamaicia. They include Myal,Obeah,Native Baptist, Revival Zion, Kumina, and Rastafari. The author argues that African-Derived religions in Jamacia are worth exploring and learning abour. Some of these religions do not even have recorded records of study or literature on them. Murphey M, Joseph. Working the Spirit: Ceremonies of the African Diaspora Beacon Press 1989 Working the Spirit: Ceremonies of the African Diaspora focuses on the spiritual ceremonies of Africans in the Diaspora, from Brazil, Buba, Haiti, Jamaican and the United States. The book provides evidence about Kumina, Obeah and Rivalal Zion, all mention in our Essay on Jamaican Religion. Alleyne Mervyn: Roots of Jamaican Culture Pluto Press 1989 The book provides an over view of African culture in Jamaica. In relation to religion in Jamaica the book provides an overview of Kumina, Myalism, Rastafar, Revival Zion, Convince and Obeah. This books also mentions African aspects of music in Jamaica which also connects to religion. Lewin, Olive Rock It Come Over: The Folk Music of Jamaica Book University of the West Indies Press (2000) The book describes Jamaican music and folk. In relation to Jamaican religion the book provides personal accounts from Kumina practitioners as well as a insightful look into the religion, dance and some philosophy of Kumina. Contemporary Kumina Queens gave accounts of callings to Kumina,rituals and their work as Kumina queens.